We are in the process of updating parts of our Weather Trainer software and ran across an article we wrote in 2009 that we refer to frequently. And sure enough there are parts that needed updating (which this note addresses), and surprisingly much is probably still new to many mariners. The "workhorses" have changed a bit, but the "secret source" is still more or less secret! It first appeared about sometime in 2009, but without any announcement, as far as we could tell at the time. It is hidden right under our noses—I mean mouse cursors—in the same place online many of us check every day to see what clothes to wear to work. But let’s come back to this jewel in a moment. Once underway on inland and near coastal waters, the NOAA Weather Radio on VHF is likely to be the main workhorse for inland waters. It gives observations every 3 hours, forecasts every 6 hours, and synopses every 12 hours. The broadcasts are continuous, 24-hr a day. A typical broadcast is about 10 minutes long, which includes some inland and mountain weather. The NWR site has many resources about each of the stations, from which you could piece together a picture like the one below that we made for our Modern Marine Weather, 3rd ed text, which has an extended discussion of this resource. Figure 1. NOAA Weather Radio coverage on the NW coast, showing typical ranges as well as station overlaps and VHF channels. The Canadian counterpart is called Weatheradio. But that is not the best place to start a study of what might take place on a planned voyage, even if you happen to have a VHF radio that will receive the signals at home. All of the information in these radio reports are available as text. It is just a matter of sorting out the best way to access these text reports. The NWS offers forecasts by region (zone) in various formats. Some of these are itemized in a publication called Marine Weather Information Guide, but we have frankly more information and perspective on the various categories of forecasts in our textbook—this Guide, for example, does not cover the coastal zone system we discuss below. There are multiple other groupings of zones in use, but the primary practical categories are coastal zones, offshore zones, and high seas areas. 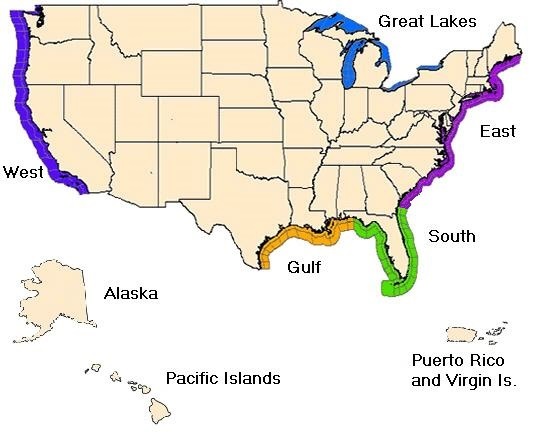 Coastal zones are typically in two bands, 0 to 10 nmi offshore, and 10 to 60 nmi offshore on the West Coast, and 0 to 20 and 20 to 60 off on the East and Gulf Coasts. Bays, sounds, lakes, and estuaries are covered in the coastal zones using custom geographic definitions to match the waterways. Coastal zones are the most localized marine areas covered by official NWS forecasts—although we can look more locally as covered later (the secret!). The link weather.gov/marine has a link to the page that brings up the Coastal Zone graphic index shown below. Figure 2. Index to US Coastal Zones. Click any colored region to zoom into that coast. 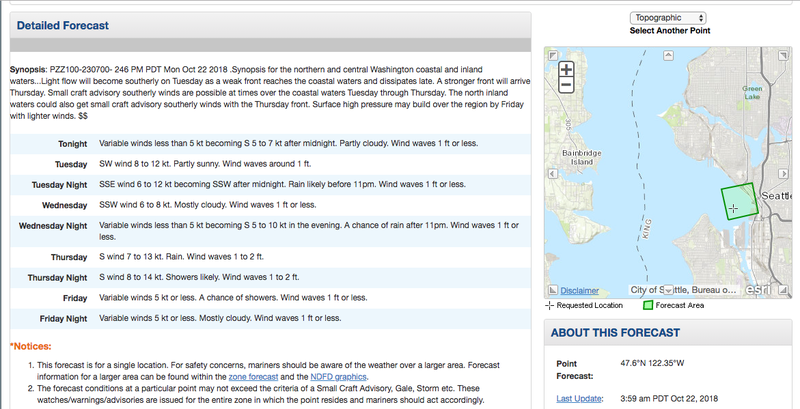 You can also get to this index with Google to "NWS coastal zone forecasts." Figure 3. Coastal waters of the West Coast. Each color, named by a prominent city, identifies a group of coastal zones called the coastal waters. 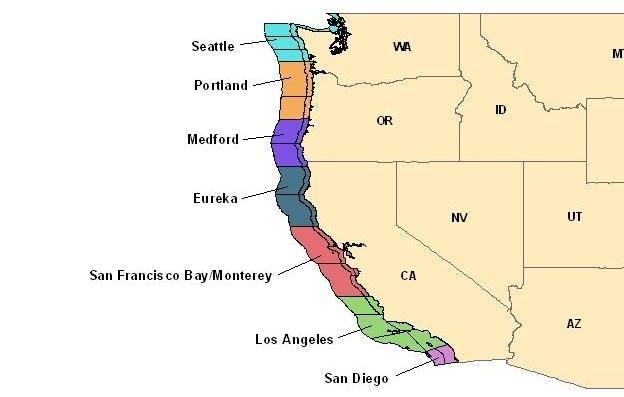 Below we the coastal zones included in the group called "Seattle Coastal Waters." Figure 4. Coastal Zones within the Seattle Coastal Waters area. When viewing online, we can click any one of these zones to get that local forecast. Below is the report we get from clicking anywhere in the PZZ132 zone (dark magenta, top right). This region is the Eastern end of the Strait of Juan de Fuca. Figure 5. Web presentation of pzz132 forecast, with several related links given. This internet approach is graphic and straightforward, with several interesting links to related information, but notice we have lost track of the name of the actual zone we asked for, which was pzz132. 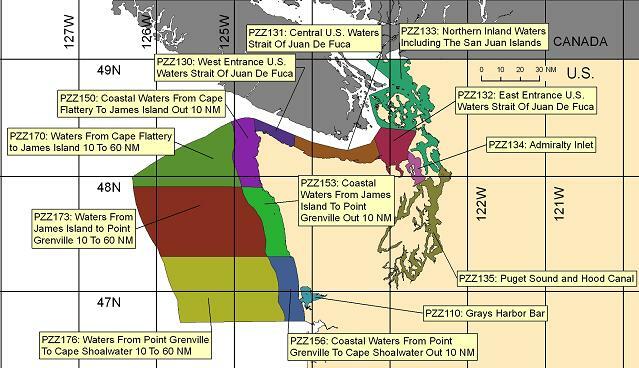 The notation "pzz100" at the top refers to the synopsis of the full region covered by the "Seattle coastal waters," which covers all the zones shown in Figure 4. Getting your forecasts this way requires a computer, tablet, or smartphone. 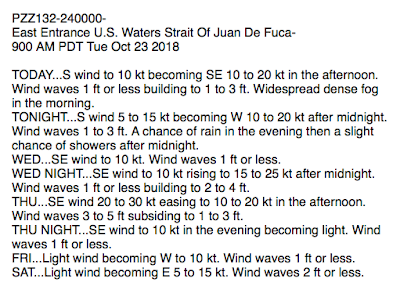 Throughout the Pacific NW waters and the Salish Sea we have good cell phone connections, so this generally works well. and follow instructions. If you do not know the ID of a buoy or lighthouse near the region you care about, then choose option 2 and enter a Lat-Lon. Then select a buoy to get latest observations and following that you can request the forecast for that region, which will be the coastal zone forecast of that buoy location. This is becoming a bit old school, but it could pay to have that number in your list of contacts as a back up if you are on a vessel when other options fail. Figure 6. Coastal waters of Florida. Figure 7. 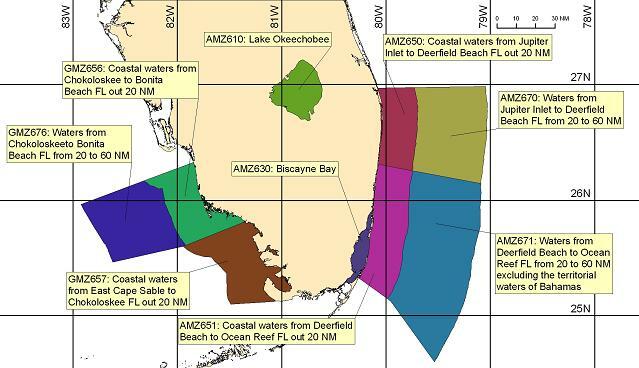 Coastal zones included in the Miami Coastal Waters region. 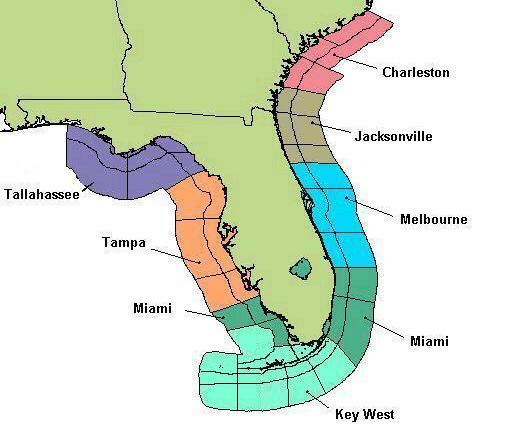 A typical file here would be found at http://tgftp.nws.noaa.gov/data/forecasts/marine/coastal/am/amz630.txt for Biscayne Bay, and the file /amz600.txt would be the synopsis for the full Miami coastal waters region shown above, which will include, by the way, the location of west wall of the Gulf Stream in this region. For local daily sailing, we would likely care about just the coastal zone that covers our waters, but when transiting a region it could be more convenient to download the coastal waters forecasts (CWF) that includes several adjacent zones. The file names for the CWF files are more complex, but saildocs has a short cut for requesting them. Figure 8. 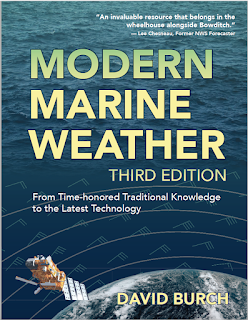 Coastal waters file names from Modern Marine Weather, 3rd ed. These files (CWF) are groups of coastal zone forecasts covering about 200 nmi along the coast. They are available from Saildocs, i.e., send fzus52.ktbw for coastal waters around Tampa, FL. Use just the green part of the full file name. When we want near live observations rather than forecasts, then the primary source is the National Data Buoy Center (NDBC)—easy to find on Google with NDBC. This site is very easy to use. Zoom into the buoy or station of choice and you see the results. One subtlety we confront are the units options. Choose either "Metric" or "English." 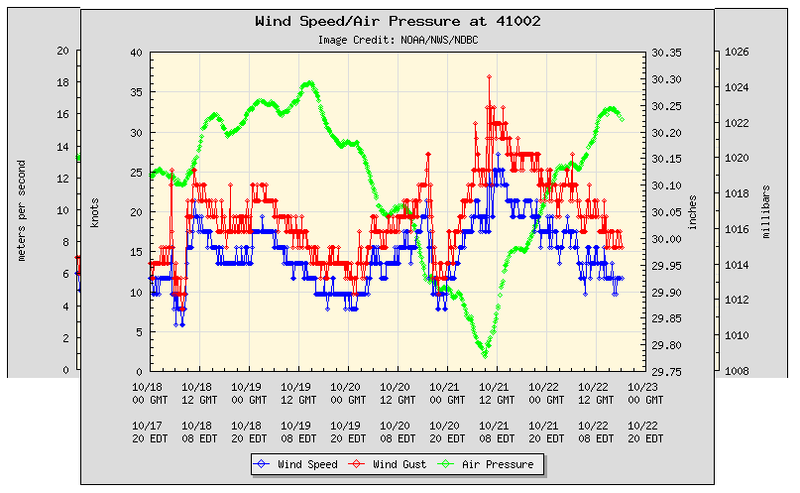 With metric we get mb for pressure but have to live with m/s for wind speeds. Choose English and you get knots for wind speed but then stuck with inches of mercury for pressure, which is intended for aviation and TV weather. The small graph icons on the pages are links to plot the data. Below is a unique option that shows both wind and pressure, showing the units for Metric and English. Figure 9. Data plots from NDBC. The inside uses English units; choosing Metric units puts the outside scales on the data. Using an iPhone, you can open this in Safari, then press the share button, and choose save to home screen. This then is effectively an app. A few clicks gets you to a display of the coastal waters forecasts, and another few clicks gets you to a list of buoys for latest observations. You can even view the latest weather maps, called "radiofax charts" on the menu. The secret source of NOAA's marine weather is actually just a normal part of NOAA's land weather. It remains a bit of a secret because landsman are very unlikely to use it, and mariners are very unlikely to know to look for it there. When this first came available (maybe 10 years ago), it did not have much written about it from the NWS... but we did have our original "secret sources" article. Now we can find more official discussion, and we know more about what it really is. 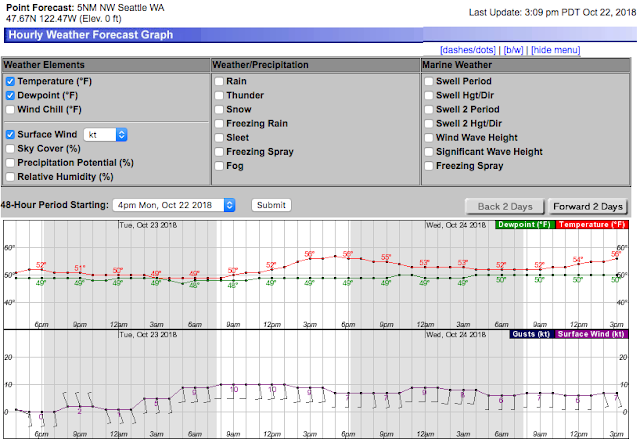 In short, it is a graphic interface to a point forecast, based on the National Digital Forecast Database (NDFD). The way to access this is to ask online for NWS weather for any town next to the water you care about. Once we get close to the water, we can go from there. 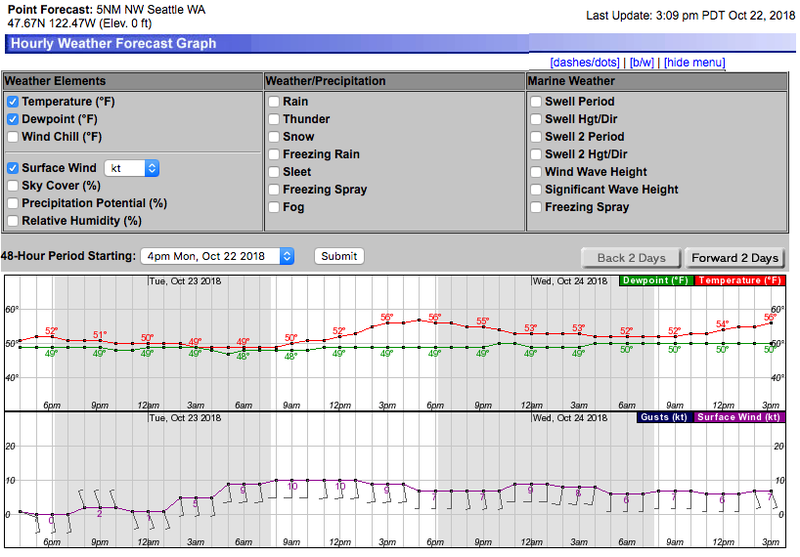 For example, let's ask Google for "NWS Seattle weather." You must include the NWS or you will be bombarded by commercial weather pages, which vary from bad to worst. The right NWS official page will have a URL like https://www.weather.gov/sew/. If you asked for "NWS Chicago weather," you would get https://www.weather.gov/lot/, and so on. That type of format is what we want. Then click the national map near where you want the marine weather. Once near the waters you want, click more specifically to get something like shown below, where we have clicked in Puget Sound, at the top edge of Elliott Bay, just inside West Point. Then in the figure we look at the forecast at another location in the Bay. The details don't matter much at this point, other than to note these are different forecasts, inside and outside of the Bay. Though not too different now, they could be notably different in other conditions. Now compare both of these "point forecasts" to the official coastal zone forecast for this region (pzz135) shown below. These point forecasts are in principle more accurate than the coastal zone forecast that covers a larger region, which might easily be expected for inland waters like these where the terrain and shape of the waterway is so varied over the forecast region. We can also get more granular information on other weather factors using the meteograms at the forecast points. These are at the bottom right of any of the above weather forecast pages. They are called Hourly Weather Graphs. Below is an example showing temp and dew point just north of West Point (Figure 10). Figure 13. Meteogram from NWS land weather page, clicked offshore, just north of West point. Note this is a forecast, not a report. 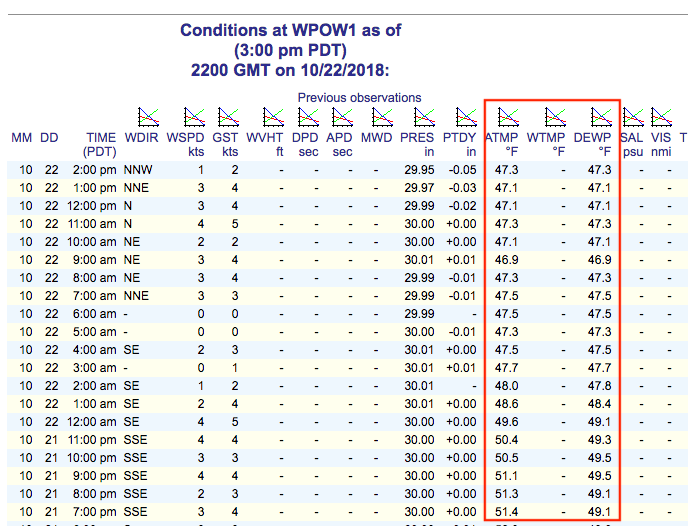 The present time (3pm PDT) is on the left side here, which shows a forecast dew point and air temp about 2º apart, which would normally be no fog.... or patchy fog. 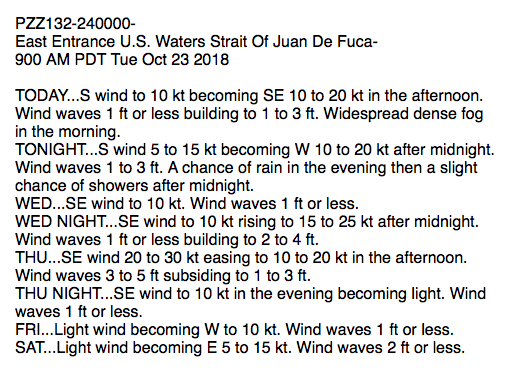 This is one of those cases where we would want the forecaster to look out the window—or at least read the reports from the lighthouse on the point shown below. These temperatures have been the same all morning, which we can learn from the reports at West Point Lighthouse, shown below. Figure 14. Data from WPOW1 showing dew point equal air temp all day. It is pea soup on Puget Sound all day today. From the Figure 13 forecast, we can expect it to clear up about 9 or 10 am tomorrow, which (looking back now) it did in fact do on time. So despite being off on Monday with regard to fog, we can see the value of this type of presentation. Frankly, these one or two day NDFD forecasts are right way more often than wrong. We also see an informative presentation of the wind forecasts in these meteograms, which is especially valuable for planning if you have a front coming through during a race. Figure 15. View of Puget Sound at 3 pm PDT as I write, viewed from about 270 ft elevation, 1.8 nmi NE of West Point. Although fog is not uncommon, this very thick fog is rare here. With that said about the workhorse sources of local forecasting, let me add that there is more to this topic. Please refer to our textbook for details and recommendations. None of the sources covered, for example, would be considered the best possible forecasting for sailors. The best would depend on the time frame in mind—plus there is some extra work involved in accessing them. For the next 12 hr or so, we would likely do best with the HRRR forecasts that extend out 18 hr and are updated every hour. For longer term, say three to five days, then it depends a bit on the waters we care about, but in the not too distant future, the answer will probably be the National Blend of Models (NBM) forecasts regardless of waters. Figure 16. 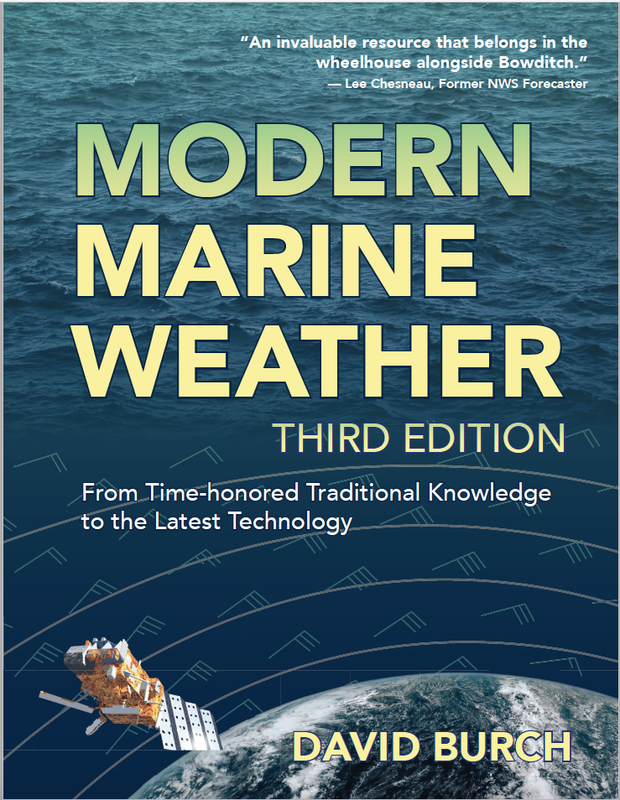 Cover of Modern Marine Weather, 3rd ed. Also available in all ebook formats.